Along with the great amount of work that goes into weaving Oriental and Persian rugs, there is also the equally time consuming process which takes place beforehand, involving both the gathering and crafting of a rug’s materials. And though some carpets being manufactured today use synthetic materials during production, both antique and modern rug makers who use genuine products, derived from various sources, certainly offer a greater deal of luster, texture and durability to their finished piece. 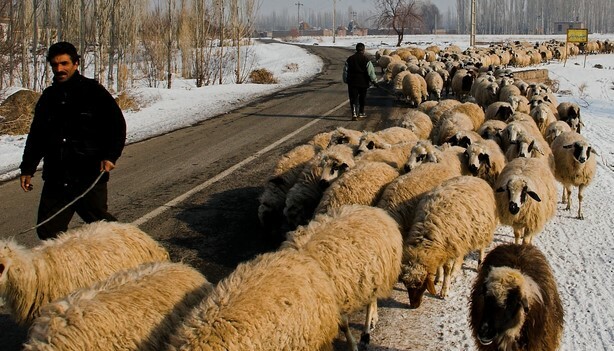 Today we explore sheep's wool, which is the most common material utilized in Oriental and Persian rugs, both today and millennia ago. The materials common to Oriental rugs can come from such animals as goats, camels and even rabbits; however, the most common material, and one used for nearly 4,000 years, is sheep’s wool. And unbeknownst to many, the quality of the wool can fluctuate significantly depending on multiple factors, including a sheep’s breed, the climate where the sheep are raised, the quality of the sheep’s diet, as well as how and when the wool is collected. Yet, even with nearly 1,000 different breeds of sheep across the face of the earth, only a handful are able to supply wool which can be used in rugs, and an even smaller number exhibit enough of a superior quality to be used in the most high-end carpets. Though sheep’s wool is typically collected in the spring and fall, it is the spring shearing season that tends to demonstrate the highest quality, with the absolute finest grades coming from a sheep’s neck and being referred to as kurk (or kork) wool. Today, while much of what is being used to make Oriental rugs is sourced locally from herds near areas of manufacture, the high demand for rugs often necessitates the importation of Merino wool from New Zealand. Once the wool has been collected, then begins the twisting of the material into long strands that become the carpet itself. In many tribes and communities across Eastern Europe and Asia this process is still performed as shown above, on machines invented many centuries ago and still very much a part of modern-day production. While wool is sometimes dyed immediately upon collection, it’s also after the wool has been twisted into skeins or bundles of yarn that weavers, and those who create yarn for these weaving artisans, use a variety of techniques to dye the wool in a striking array of colors. And unless they are dyed with synthetic colorants, which is uncommon outside of contemporary rug making facilities, the palettes are created using a wide range of natural resources, such as plants, insects and abrash, the latter being indicative of a weaver who likely took part in the entire process. These skeins are then used by weavers to produce beautifully rendered carpets or sold by suppliers to local artists so they can begin their inspired and imaginative work. Want to learn more about the art of weaving? Read the article we wrote last year about the process of manufacturing Oriental rugs here. Also, be sure to check out our inventory of both antique and modern handmade carpets from around the world, or visit our showroom. Our specialists can help you with everything from having your rug appraised to having it cleaned or repaired in order to keep it looking its absolute best.